of course we have craft time, but they also love some of the fancy things they can try on. And my niece thinks she gets to take one of my tiaras home... not going to happen missy! One of my very favorite things is this painting that my grandparents picked up in Paris on their second trip there in September 1977. While exploring the Montmartre and Sacre Coeur they came across the many artists set up painting and selling their works of art. This was painted by Marc Svabic from what I could decipher on the back written by my grandfather. On a return trip in 1982 they saw the same artist in the same spot, my grandfather, I am sure stopped and said "Bonjour" I love how colorful and how whimsical it is. I can look at it for hours and see something new every time. Don't forget to look up around your own house, there are all sorts of great things you see everyday without even looking at it. When the cats away---eat raw fish! A few weeks back when John was out of town I made one of my favorite things, Ahi Poke...... We have a wonderful and amazing local Asian grocery stores, Uwajimaya. I love to go in there and go up and down the aisles. Half of the things in there, I have no idea what they are but it is still neat to look at. They have the best seafood, some of it is even still alive. But you can get sashimi grade fish and it will be less expensive then the frozen pieces you will find at your local store. 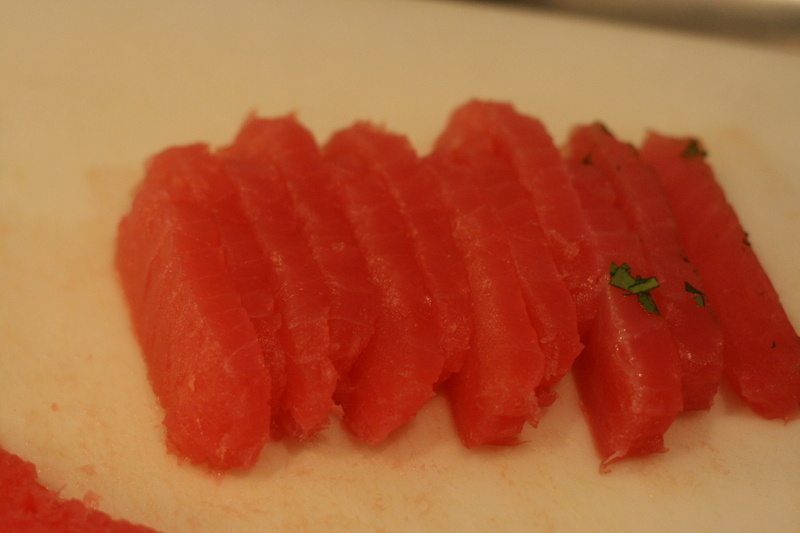 I picked up some Ahi Tuna, it was beautiful and pink and my mouth waters just thinking about it. I decided to make some Ahi Poke, a traditional Hawaiian recipe that is delicious! I found this recipe from Williams-Sonoma that is fabulous! Recipe from Williams-Sonoma cookbook “Savouring America”. Serves 6. 1. Using a sharp knife, cut the tuna into small 2cm by 2cm cubes. 2. 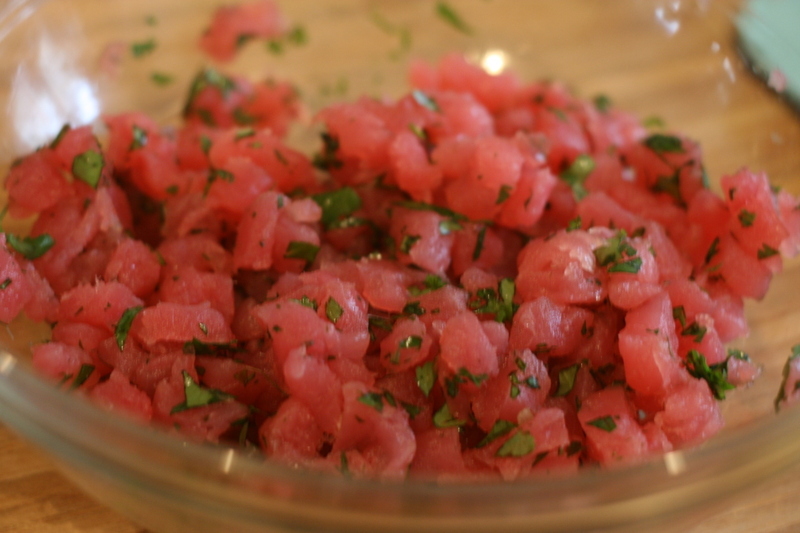 Place tuna in a bowl and add all other ingredients. 3. Toss the mixture gently to blend evenly. Cover the bowl and refrigerate until well chilled, about 1 hour. 4. Serve garnished with coriander leaves. Notes: Ahi poke is best eaten within a few hours of being made, but can be kept in the refrigerator for one day. Hawaiians use Maui onion, but for those of us outside the US, any sweet onion will substitute. Yellow-fin tuna is best for this recipe, although any other sashimi-grade is fine. I can't believe it has been 4 years already since I started my blog. Over 650 posts, thousands of comments and more than 300,000 visits, just to stop in and see what I was up to. Either to check in on a Martha recipe or craft, an idea for a cake or to even see where the Tour de France is and what do you eat when you stop off in Monaco. You can find a little of everything here. It all started with my love of Martha and all the things she does, well except for the gardening. I can grow so basil and tomatoes, but that is one of Martha's favorite things I don't enjoy. Never being about Martha but of all things I like to do like Martha beget the name "Good Things: Life of a Martha Stewart Wannabe" But the little old blog grew from there into cake decorating during my cake classes and then into the home of my giant Tour de French Cuisine project now going into its 3rd anniversary as well. The Tour de French Cuisine, now beginning its 3rd Tour around France follows the Tour and all the spots it goes to from the smallest village famous for its beans used in Cassoulet to the Champs Elysees. A true labor of love and so honored for the following it has received. I still am working on the editing of 2009 for the book soon to be for sale here and starting the 2010 research. Hoping for 4 more great years, thanks for tuning in! First part of my project was to use the same template that came in one of the Martha roses kit. I scanned it so I also had extra copies to make unlimited amount of roses. You can use these templates as well, just print them at 70%. ****right click and save these to print them out to the correct size. To make the roses you will need 5 inner leaves and 12 of the large outer leaves. The Black Crepe paper came in a big sheet that was folded. At each crease it was the perfect size for the template. I stacked 8 sheets on top of each other and then laid the template on top and stapled it all together and then cut each petal out. To make the leaves have a little life to them you hold one with both thumbs in the center and your forefinger on the revers side. Gently pull and stretch the paper with your thumbs sculpting into a petal shape. After that step use a toothpick to round the top edges of the petals in the opposite direction of the "cup" of the flower. Now that you have them all stretched, rolled and ready to go. You will now need floral wire and floral tape. I found 18 inch 22 guage wire at Michaels and the Martha Stewart crafts has some great floral tape. Wrap the wire with some floral tape and stretch it as you wrap it. That makes it sticky and will be easier to attach the petals too. Starting with the smaller inner leaves around the wire overlapping each petal over each other at the half way point. After the inner leaves wrap the base with tape and then start with the larger leaves doing the same thing, overlapping as you go. Wrap with floral tape after 3 or 4 petals to make sure things are tight. Once all 12 outer petals are attached wrap them with the floral tape one last time, making sure to stretch it as you go and wrap along stem for 3 or 4 inches. Next step when they are all done, I used a Martha glue pen, one of my favorite tools, and just rubbed a little glue on the edge of some of the petals. Not all of them, just 5 or 6 per flower. If you make some let me know how they turned out. My Great Grandmother- Micky as she was called. Really Adeline McCormick Pearson. She lived to the ripe old age of 103. She was cutest thing you have ever seen. She made the worlds best Macaroni & Cheese, Clam Chowder, Fried Chicken and the #1 cookie of all times. A cookie that in fact was so good my mother and I got in a fight over them and didn't talk for a few months. She was the funniest little thing and I miss her dearly. When I was a little girl and we would go to visit her in the summer we begged her to make the mac and cheese in the blue box, you know the Kraft one. Well she made the best homemade Mac & Cheese in the world and I wish more then anything she could still make it for us and that I didn't want that stupid blue box instead of hers. Heat oven to 375 degrees. Butter a 3-quart casserole dish; set aside. Place bread in a medium bowl. In a small saucepan over medium heat, melt 2 tablespoons butter. Pour butter into bowl with bread, and toss. Set breadcrumbs aside. In a medium saucepan set over medium heat, heat milk. Melt remaining 6 tablespoons butter in a high-sided skillet over medium heat. When butter bubbles, add flour. Cook, whisking, 1 minute. While whisking, slowly pour in hot milk. Continue cooking, whisking constantly, until the mixture bubbles and becomes thick. Remove pan from heat. Stir in salt, nutmeg, black pepper, cayenne pepper, 3 cups cheddar cheese, and 1 1/2 cups Gruyere set cheese sauce aside. Pour mixture into prepared dish. Sprinkle remaining 1 1/2 cups cheddar cheese, 1/2 cup Gruyere , and breadcrumbs over top. Bake until browned on top, about 30 minutes. Transfer dish to a wire rack to cool 5 minutes; serve hot. When it comes to cookware there is nothing better than Le Creuset. The French cookware that was started in 1925 by two Belgian industrialists names Armand Desaegher and Octave Aubecq. Desaegher was a casting expert and Aubecq was an specialist in enameling. The created the first round French Oven or Cocotte as their signature piece and is still to this day their most popular piece. Le Creuset is still made in the same factory in the same town in Northern France, Fresnoy le Grand in the Picardie region just 120 miles outside of France. In the 1930's the first color Flame (orange) came out and has been followed by many colors over the years. My favorite is the Cherry (red) and I have more pieces then one person should have. The best thing about Le Creuset is that if it is treated properly it will last forever and in France is passed down generations. There are a lot of cast iron enameled cookware out there, but make no mistake, there is only one Le Creuset and none of the other ones compare to the quality and longevity of Le Creuset, not even Martha's. The Le Creuset label has a wide range of products from the flagship enamel lined French oven to grill pans and stoneware to cooking utensils. My newest pieces from Christmas is a Saucier pan and a Pate Terrine and I can't wait to use them. But now I have my eye on the French Onion soup bowls and maybe some petite berry casseroles to add to the collection. Now that we have the dreary colors of orange and black behind us it is time to get ready for the holidays. This year Martha Stewart and company along with the Crane & Co created the most beautiful cards to send to your friends and family. The beautiful calligraphy line drawings on the Santa and Tree cards are my very favorite and the playfull tree and coral card is perfect for those lucky enough to live on the coast of somewhere beautiful. With more then 10 varieties to choose from there is a card for everybody's taste. I added a little something extra to these cards, some glitter of course. Only took a few minutes and the little extra sparkle is great. So now here is the fun part, thanks to my friends at MSLO I have some of these amazing cards to give away to you. Just leave me a comment and I will pick four winners to receive these great cards, with the addition of the special glitter touch from me. I will pick four winners this Saturday, November 7th and will contact you for mailing instructions. Good luck and enjoy! Enchanted by Josephine: The FRENCH HISTORICAL CHALLENGE- Oh-La-La!! Join me!